Heat oven to 375°F. In 10-inch skillet, cook beef, seasoned salt, white pepper, bell pepper, jalapeño and onion over medium heat, stirring occasionally, until beef is brown; drain. In medium bowl, stir together all remaining ingredients. Pour evenly over beef mixture. Bake casserole 40 to 50 minutes or until light golden. 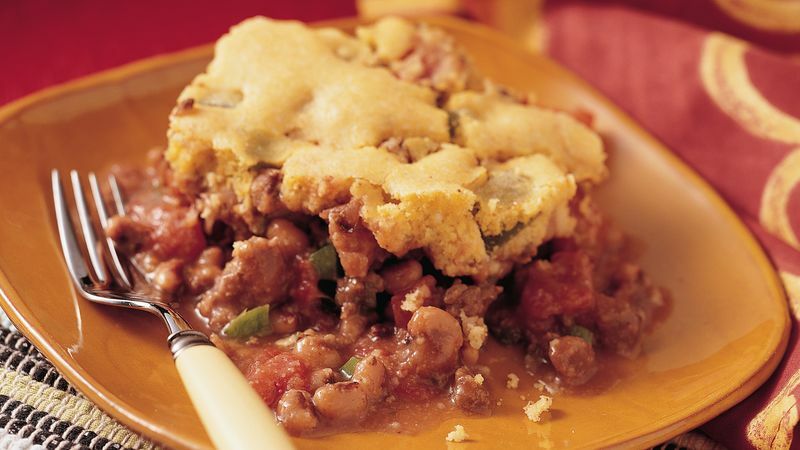 The topping on this spicy casserole bakes up light and tender. If you like a heavy, denser-style cornbread, leave out the baking powder in the topping. Named for the black "eye" on its inner curve, these beans are thought to have been brought to the South during the time of slavery. You'll find them fresh, dried and canned.